This particular recipient of the MUDC's tangerine and Delft blue livery in 1973 is my favourite and is,quite possibly, unique. Experts on vintage vehicles might be able to enlighten us. 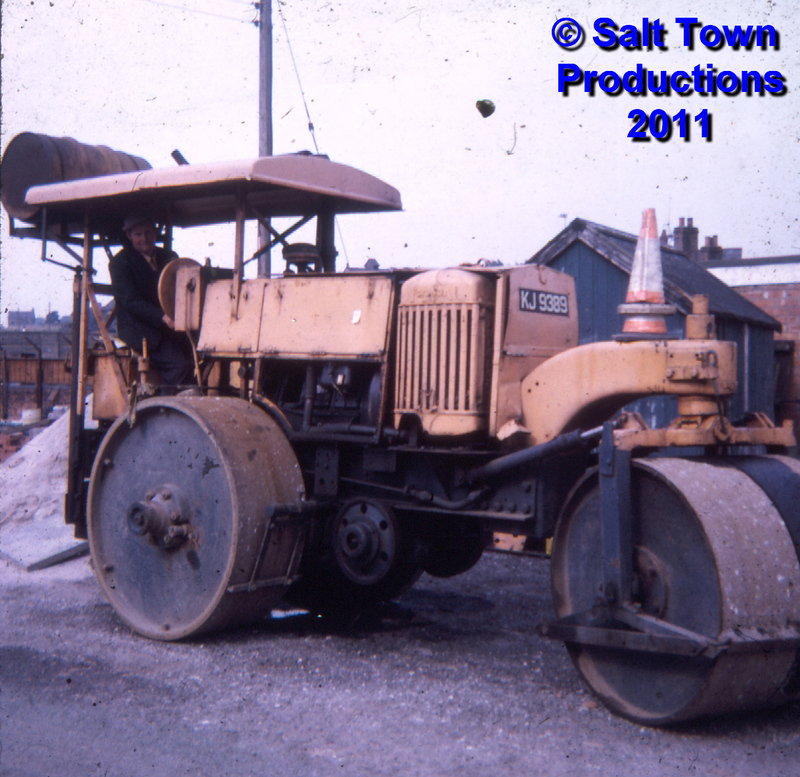 It was originally a steam roller but, according to the story its driver told me, had been converted into a diesel some time in the 1930s. Certainly it has a sort of home made look about it. Note particularly the oil drum 'fuel-tank' slung high above the driver and designed to give Health & Safety Inspectors the heebie-jeebies. Also of interest is the road-cone holder at the front, precursor of all the coffee-cup holders in posh cars to come. I don't know what happened to this venerable vehicle. Presumably it was scrapped. This photo was first published on Facebook on 17th May 2011. Dave Roberts I've just done a spot of googling and, although there are quite a few photographs of steam rollers converted to diesels, I can't see one that looks anything like this one. Jonathan Williams According to my records, this was the Town Clerk's company vehicle. And very well-deserved it was too. And there was an expense account to boot.....25 cubic gallons of steam per month plus all the cones you could grow. I have a similar vehicle to this day, as the upholder of the Town's traditions. Can't get the tangerine paint these days though, so mine is silver, in tribute to the recycling bins. Jonathan Williams This is indeed a remarkable series, and as intimated before, I would like to investigate how we might best appreciate and promote such a wonderful archive as a Community. Perhaps we could discuss this soon Dave, with Kerry and I on behalf of the Town Council. Let me know what you think. This needs shouting from the rooftops. Oops..they disappeared ! Dave Roberts I think that's a very good idea, Jonathan.